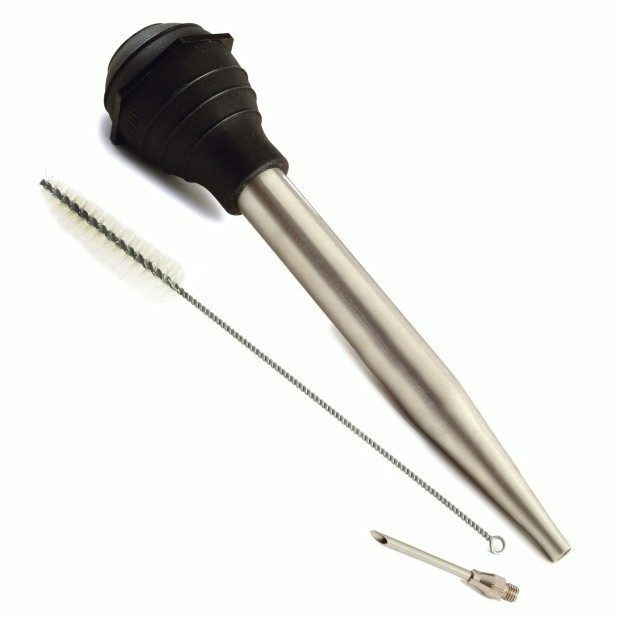 Norpro Stainless Steel Baster Only $8.77! You are here: Home / Great Deals / Amazon Deals / Norpro Stainless Steel Baster Only $8.77! Head over to Amazon and order the Norpro Stainless Steel Baster for Only $8.77! Shipping is FREE on orders of $35+ or if you have Prime! The secret to beautiful roasted poultry, served moist and golden brown, is constant basting. This tool creates powerful suction to retrieve succulent juices. For best results, run it under hot water before basting, so the temperature of the baster will be warm. Measures 11-inch/28cm. Holds 1-1/2-ounce. Silicone bulb heat resistant to 450F/230C. Stainless steel with needle and brush. Silicone bulb.